The Sanctuary of Atotonilco -- Mexico's "Sistine Chapel"
FLASH! 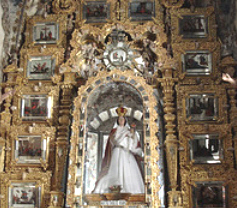 On Friday, July 11, 2008, the Santuario de Atotonilco was named a UNESCO World Heritage Site. It joins San Miguel de Allende in this signal honor. A pproximately six miles from San Miguel de Allende lies the village of Atotonilco. It's a quiet, dusty place where flies buzz around the dogs and old folks relax on the benches. I fits a lot of the old stereotypes of the dusty Mexican village. And it is home to one of the holiest shrines in Mexico. The church known as El Santuario de Atotonilco is a place of pilgrimage and penitence. People travel from all over the country to pray and meditate behind these walls. And it is very much worth making your own pilgrimage to see the astonishing art that is the hallmark of its interior. The outside of the church is simple—a belled dome rising above high pink-gold stone walls. But when you pass through the carved wooden doors, you enter another world entirely—one of fantasms and mythical creatures, flowers, bleeding penitents and gilded baroque virgins, suffering saints and Jesuses. Frescos, gilded altars, sculptures, painted mirrors and murals cover every visible surface in no discernible order or pattern. In fact, it has often been called the Sistine Chapel of the Americas. Begun in 1740 under the direction of Father Luis Felipe Neri de Alfaro, the church took more than 35 years to complete. The frescos on the walls were created by a local artist, Miguel Antonio Martinez de Pocasangre in the "folk baroque" style. Since the church is dedicated to Jesus of Nazareth, many of the frescoes depict scenes in the life of Christ. But the good priest and Sr. Pocasangre seemed to prefer the bloodier events in the Savior’s life. The swirling color and form seem to focus heavily on blood and suffering. After centuries of damp, dust and neglect, the shrine was in deplorable condition until about a dozen years ago. In 1996, the World Monuments Fund added the Sanctuary to its list of "100 Most Endangered Monuments." With seed money from American Express and more than $100,000US from the state of Guanajuato, the building's facade and murals were inspected and analyzed, then cleaned and restored to the highest standard. 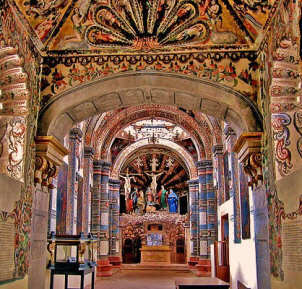 Now the Santuario de Atotonilco has been recognized for the precious artistic and cultural treasure it is with its designation in July, 2008 as a UNESCO World Heritage site. The Sanctuary is a pilgrimage church in a sleepy village. Visit most any weekday, and the plaza in front of the church will be nearly deserted. Inside, a ghostly quiet will hug the wildly painted walls. But on Sunday—market day—the square springs into raucous life. You'll find all the usual market wares here, but they're also punctuated with stalls full of rosaries, incense, candles and cast metal milagros. Also on offer are the knotted rope whips used by flagellant pilgrims who are drawn to the church for special penitence services held several times a year. During the pilgrimages, thousands of peregrinos come to Atotonilco. Some of them walk around the church on their knees in an attempt to duplicate the sufferings of Christ; others tie bundles of spiny nopal cactus to their bare chests, wear hair shirts, or beat themselves with whips. The church has dormitories and dining halls for the approximately 100,000 who come annually. The name Atotonilco means "Place of the Hot Waters," and the location has deep religious roots. As far back as pre-Hispanic times, the hot springs dotting the immediate area were thought to have curative powers. Healing ceremonies associated with the hot water were held on this spot. The Sanctuary also holds an important place in the political history of the country. Ignacio Allende, the native son for whom San Miguel de Allende is named, was married here. 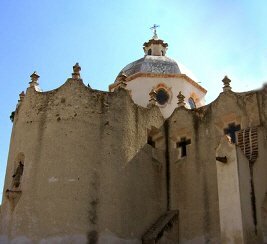 And when the fight for independence from Spain began on September 16, 1810, it was to this small church that Padre Hidalgo led his rag-tag army. They grabbed the banner of the Virgin of Guadalupe from the wall and used it as the standard under which they fought the Spaniards for freedom. One of the most venerated items in the church is the miraculous statue of Our Lord of The Column. Several miracles have been attributed to this statue of a bloody Christ leaning heavily on a gilded pedestal. 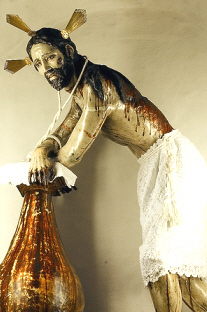 Every year, at the beginning of Holy Week celebrations, the statue is carried in a solemn midnight procession from Atotonilco to San Miguel de Allende. The statue will remain in San Miguel until Holy Week observances are finished. The torchlit procession is one of the most fascinating celebrations in a season of glorious processions and observances. A morning or afternoon pilgrimage to the Sanctuary of Atotonilco is a “must-see” for any visitor to San Miguel de Allende. Take the Carretera a Dolores Hidalgo road about ten minutes out of San Miguel. Stay to the left and take the "Desviacion a Atotonilco" turnoff.